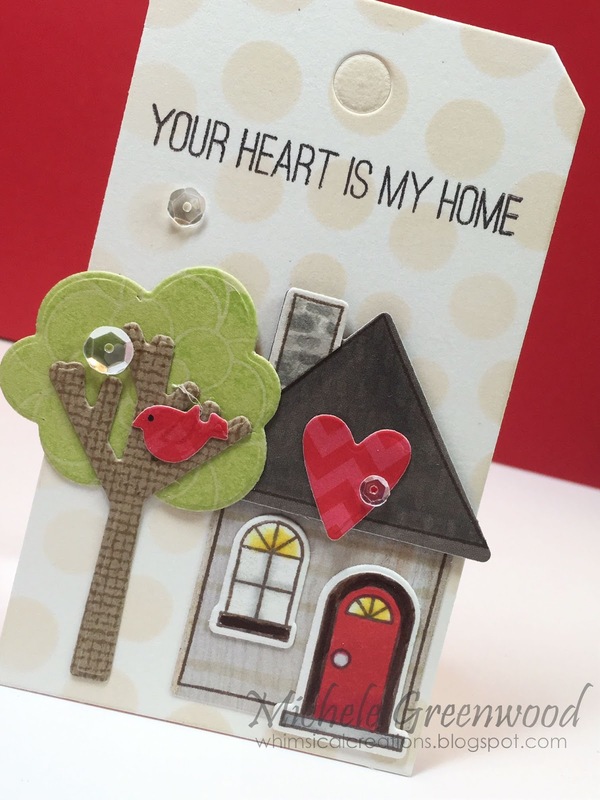 A short post to thank the very generous Simon Says Stamp for collaborating with us this month. Simon Says Stamp is such a wonderful company. Innovative products, great designers and design team, a fantastic owner, and great people working there. We love that they put so much good into our little crafting world. This month our challenge was to add a bit of sparkle to our projects. Here are some entries that caught our eye. Love the colors and design of this. Very tropical, and a lot of us are ready for warmer weather. Nice work, Sally! glossy accents and the gold touches. Well done, Heidi! 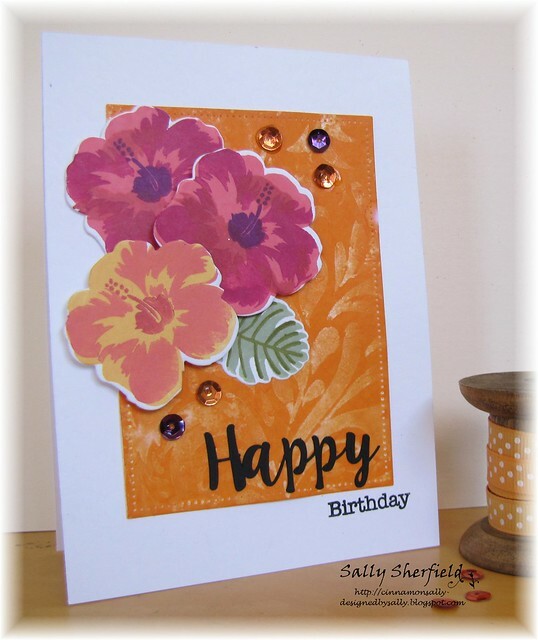 Love the simple color palette yet exquisite detailing on this card from Karin. Love the feeling that this card evokes. So pretty, Lea. 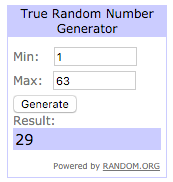 On to random.org to choose the winner of a prize from Simon Says Stamp. the shaker elements. Such a fun card, Elizabeth. Elizabeth, please send us an email and we will organize your prize. Thanks so much, everyone, for joining us this month. Come back tomorrow to find out about next month’s challenge. I bet you’ll like it. This is my second card for this month’s theme of A Bit of Sparkle. And I was so happy to be able to use the Monthly Kit from Hero Arts. I really do try quite hard to not impulse shop for craft items, but when I saw this kit I knew it was a must have for me. Something about the dies included just said “we must come live at your house”. I am not one to ignore a talking die. 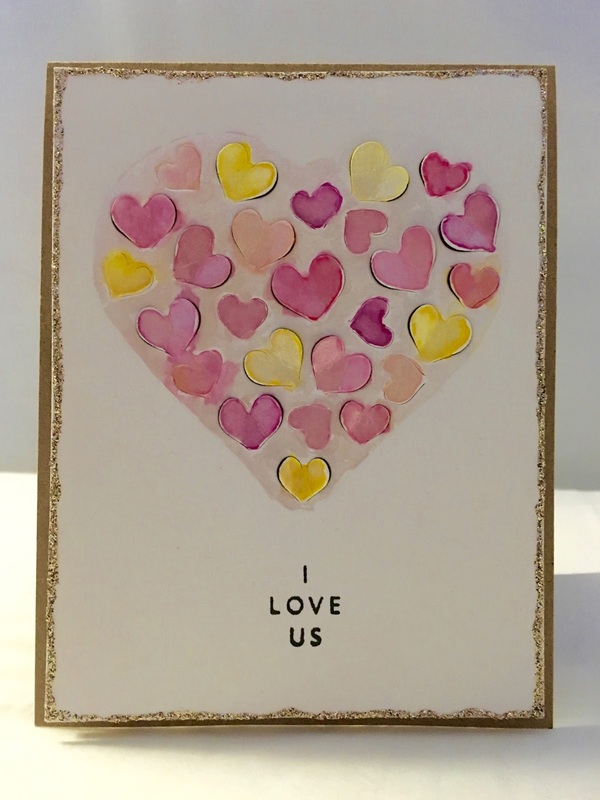 This is the card I made for my husband for Valentine’s Day, and on the inside I stamped “you make my heart flutter” from one of the stamp sets in the kit. 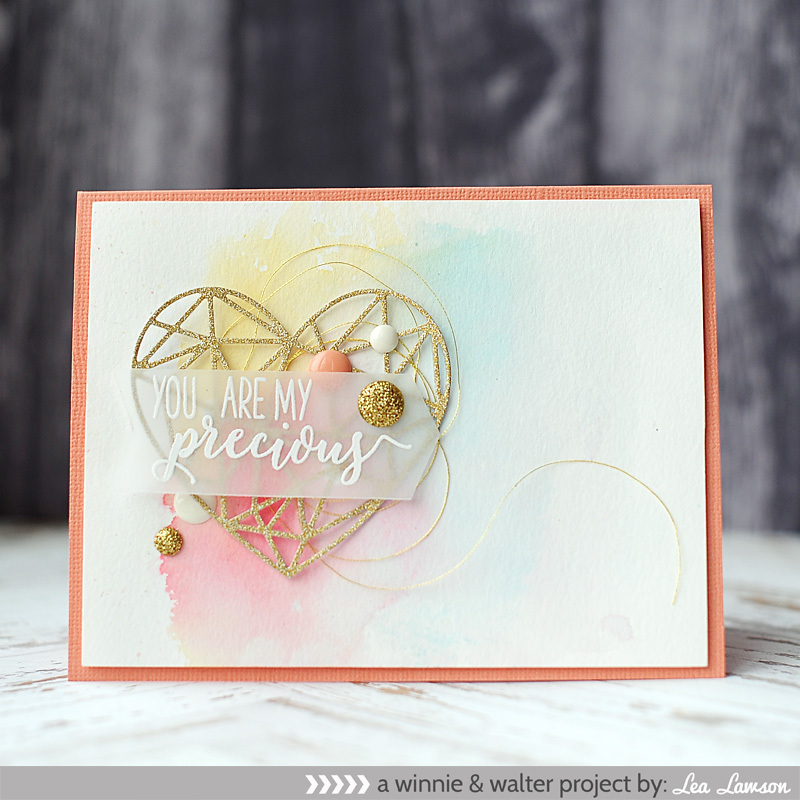 To add a bit of sparkle to the card I used the shimmery paint from the watercolor set to color in the background of the colored heart die. 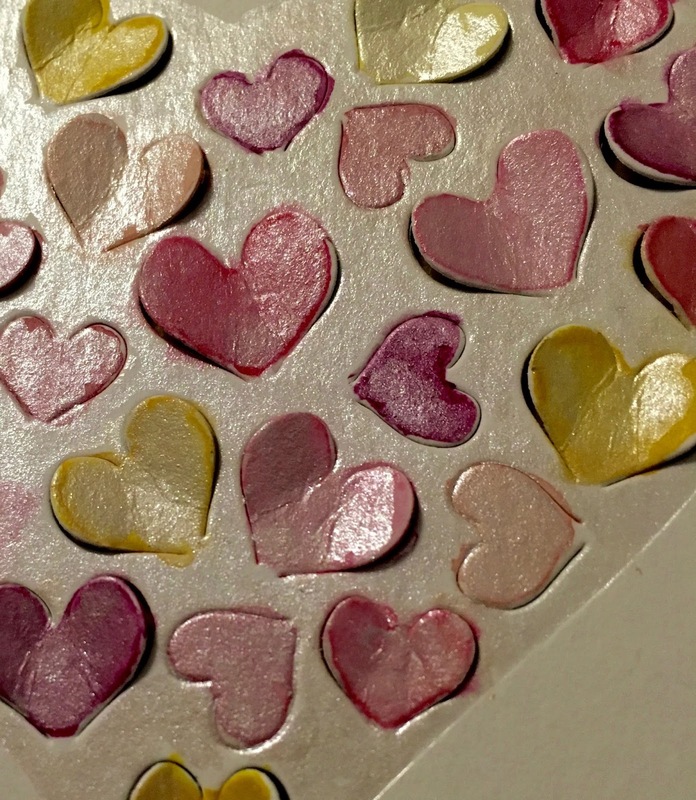 Just a bit of shimmer, and I wasn’t careful, as I liked the messy look it created when mixing with the colored hearts. Today is the last day to add your submission to our Challenge for your chance to win a prize from Simon Says Stamp. Kathy, The Crafty Nurse here today with my collaboration card share with Simon Says Stamp. If you are ever looking for me you can always check my Simon Says Stamp cart, because I’m usually there buying up the store! 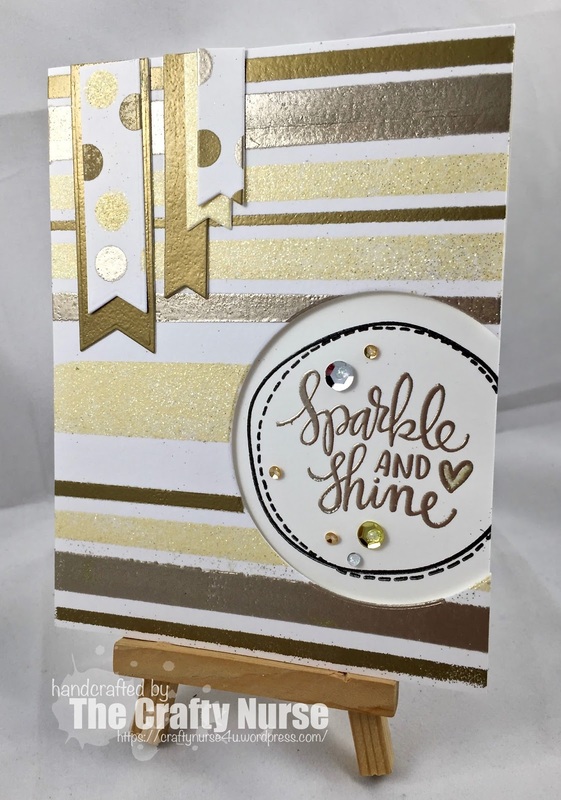 I’ve been a long time Simon Kit Club member and I couldn’t resist using the Sparkle & Shine stamp set by Kristina Werner. For the technique, I popped over to Jennifer McQuire’s Blog for her background embossing techniques. I like the look of a circle cut out from the side and popping up the card panel for dimension. I used a Perfect Medium Pen to emboss my heart with some of that sparkly Enchanted Gold powder. The month is coming to an end very soon, so I hope you’ve gotten your card entered for this month’s chance at the Simon Says Stamp gift certificate. Keep sparkling! and I have quite a sparkly hydrangea for you. When I started designing my card (in my head) and using Jennifer McGuire’s technique of distress ink lifting, my card looked quite different from what you see here. 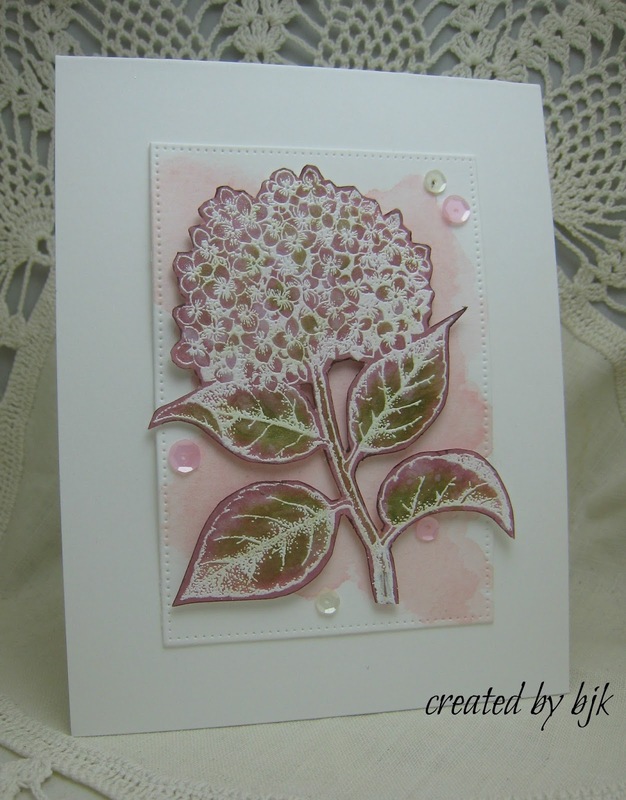 I started by white embossing the hydrangea on a piece of 5×6 white cardstock and then using victorian velvet distress ink saturated the card. With a small brush and water, I took some of the color away on the flower and leaves. Then added some peeled paint ink to the leaves and a bit to the flower and took some of that color away. Lastly, WOS was added and between that and the shiny embossing it was good – but the background was way too dark for me. Out went the original idea. Fussy cut the flower, made a watercolor wash background, die cut that piece, put it all together and added sequins. Decided to leave it alone and add a sentiment inside when I need the card. 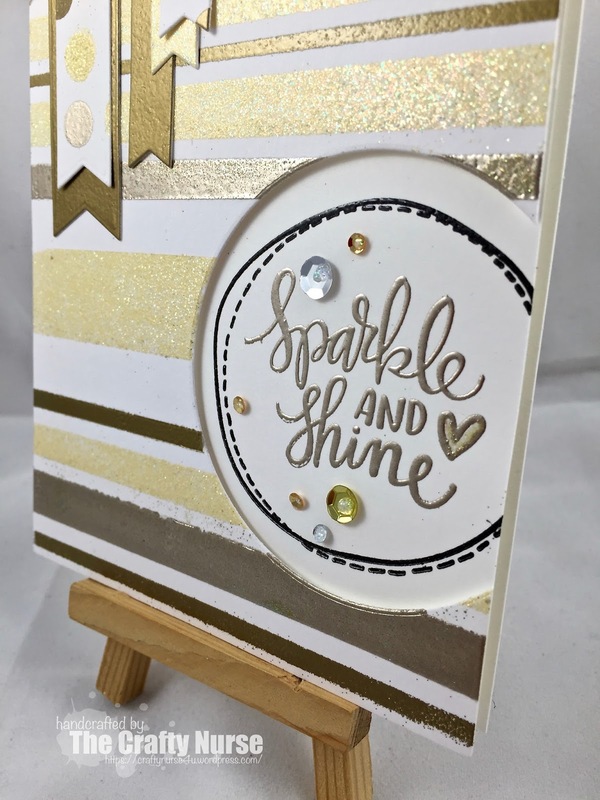 There is still time to enter this month’s challenge and win a prize from this month’s sponsor, Simon Says Stamp – so hope to see a sparkly, shiny, glittery card from you here. 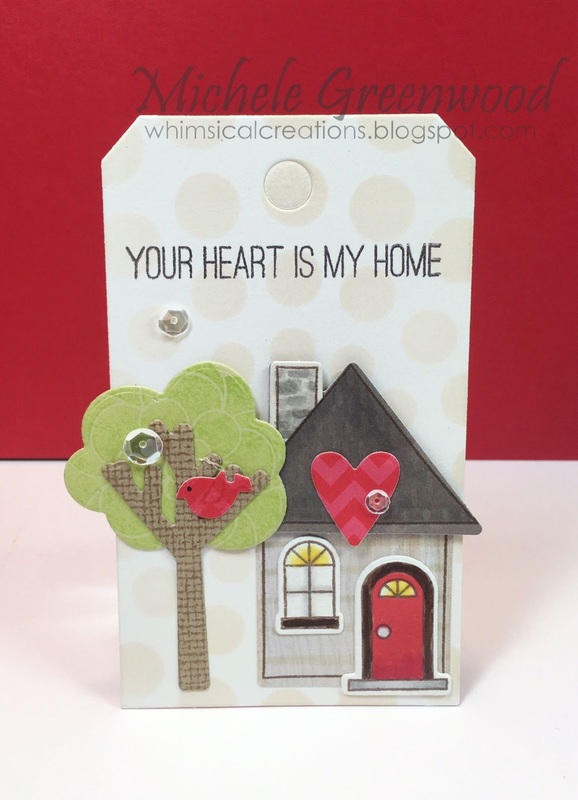 Welcome back to another collaboration post with Hero Arts and Simon Says Stamp; the DT has thoroughly enjoyed their products. I order almost all my supplies/products from SSS so this is a super fun collaboration! And February is all about ‘a bit of sparkle‘; you can see the details HERE, hope you play along! Hubby and I just celebrated 24 yeas of marriage – WOW; time really does fly; we’re taking a very quick trip this weekend so I made this little tag which I will attach to his gifts; LOVE the sentiment! I used a SSS tag and sponged Kraft ink over MFT’s Circle Burst stencil for some fun background action. And the rest of the tag is exactly why you do not throw away scraps of paper! The base of the tree is actually cut from a kraft heart that I had stamped with MFT’s linen background and Kraft ink – it was just hanging around and I thought it added fun dimension to the tree! The house is made 100% from scraps of designer paper, just bits and pieces here and there. I used Copic markers to accent portions of the house; added some moonshine sequins and clear Wink of Stella on the bird, top of the door (window) and the window. This came together really quickly and I know hubby will appreciate it! Thanks for stopping by; hope you’ll join our sparkle challenge!